Lattice and The Beta Angel Project are at it again! This time, we decided to chat with Taylor about the research of climbing efficiency. This will be a topic that is certainly distinct from our past collaborations which involved the hard numbers and precise methods of finger strength and RFD (Rate of Force Production, or contact strength). However, methods of studying climbing economy have seen a recent increase in rigor. Climbers should use a suite of measures, rather than any single measure, to judge climbing economy. The top quantitative measures include the“jerk” of the hips, the complexity of a climber’s movement, and the amount of pause in a climber’s upward movement. These methods are not yet widely available due primarily to cost of initial measurement units (IMUs). One qualitative research study completed in the UK involves 15 measures and can easily be transferred into practice. 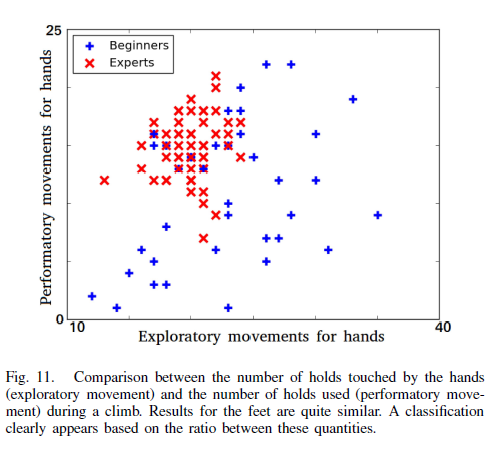 Climbing economy is very closely related to how we learn in climbing, and can be viewed through different ways of measuring “exploratory” vs. “performatory” movement. Ratio of immobility to mobility during a climb. These measurements are not yet widely available, but will likely become more so as the price of IMUs go down, and/or coders integrate Machine Learning (ML) techniques in to new video analysis tools. Nicola Taylor and her team (2018) requested help from an expert panel and group of coaches in the UK to find qualitative indicators of good climbing movement that anyone can use. The indicators are: the accuracy and precision of (1) hands and (2) feet, (3)balance, (4) hip fluidity, (5) minimal use of exploratory movement, (6)sequencing, (7) lower body movement initiation, (8) extension / body tension,(9) skill selection is appropriate for move, (10) bent vs. straight arms, (11) pacing, (12) commitment, (13) resting (14) clipping, and (15) maintenance of technical proficiency across route. You can see a Reddit conversation here with the grading sheet or visit the research inventory for more information on other research in to human movement. How important is repeating routes between 2-5 additional times to your current training? Could you see yourself doing this more? What would be the pros and cons of promoting efficiency while fatigued? Do you think the 15 qualitative efficiency skills highlighted above are comprehensive? What would you add? Do you already use the three indicators (hip jerk, entropy, and immobility) subjectively in your training? Would it be beneficial to have a computer program track this for you?